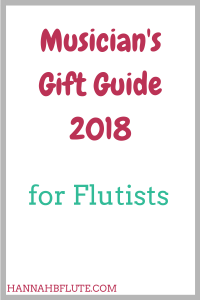 As much as we musicians want new instruments, this gift guide is going to target accessories, sheet music, and other small gifts. Feel free to share this gift guide with all of your friends so they can buy you a gift you’ll actually use. And friends and family, any gift is much appreciated. We musicians are broke, and it’s hard for us to spoil ourselves. So thanks for spoiling us. Now for the gift guide! Every musician needs pencils. I don’t care how many pencils I already have. You can never have too many pencils. Pencils are better than pens, because you can erase pencil marks. You can’t erase pen marks. Personally, I prefer mechanical pencils, but throw in a sharpener and I’ll accept any pencil. With a new year comes new planners and notebooks. Musicians are busy people, and we need some way to keep track of everything. I don’t use a paper planner, but I do like to take notes during my practice sessions. Even though I don’t *need* a new notebook, I will use it one day. If you use a planner to keep track of your stuff, ask for a new planner. Like I said, musicians don’t make a lot of money. Some planners cost a lot of money. A planner is a great gift idea for a musician. If you have a certain piece of music in mind and don’t want to spend the money on it (IMSLP, anyone? ), consider putting it on your wishlist. Sheet music can get expensive, especially for new music that isn’t in the public domain yet. If you don’t know exactly what sheet music you need or want, then you can ask for a gift card to a music store (see below). And even if you don’t end up playing that piece soon, you can still use it to practice sight reading. An instrument stand is a necessity for long practice sessions and rehearsals. If you play multiple instruments, a stand will keep your instruments safe when you aren’t playing them. I have a variety of flute stands, and I use them for different purposes. My largest stand has a peg for my alto flute, and I use that stand when playing alto and/or practicing at home. I also have single flute and piccolo stands that are great on the go. Don’t set your instrument haphazardly on a chair. Use and instrument stand to keep your instrument safe. I don’t know about you, but I’m not the best at washing my flute cleaning cloths. After swabbing your instrument many times, your cleaning cloth can get pretty dirty. Like pencils, you can never have enough cleaning cloths. Beaumont Music makes some really cute cleaning cloths and instrument swabs. For students, it will be much easier to get in the habit of cleaning your instrument if you have a cute cleaning cloth. If you’re case is falling apart, or you’re sick of carrying your music in your hands, consider asking for a music or instrument bag. Beaumont Music makes some really cute music portfolio bags. You can put sheet music in there, and I have even used mine as a purse! Beaumont also makes cases for flute, clarinet, saxophone, and trumpet. Fluterscooter also makes really cute bags for flute, clarinet, and oboe. The Fluterscooter bags are more expensive, but they are nicely made, and you will get compliments. Sometimes, you don’t want to buy something specific. If you don’t know what item to buy for the musician in your life, get them a gift card. A gift card is great, because the recipient can choose what they want. Whether that is a specific piece of music or the right instrument stand, no musician will turn down a gift card. Don’t want to give a generic Visa card? Try Amazon, iTunes, or specialty music shops. There are plenty of other things you can get for the musician in your life; I’ve barely scratched the surface! Musicians, what’s on your wishlist? And friends, what else do you need from us to get the perfect gift? Comment below! Previous Previous post: Am I a Workaholic?